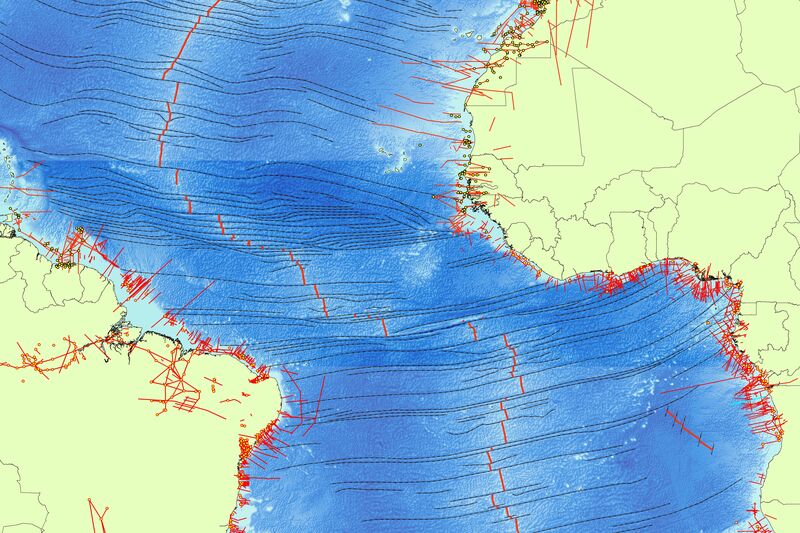 Our Digital Maps of the Equatorial Atlantic Margin are provided in ArcView format and are continually updated. This Digital Atlas summarises the findings of more than 337 scientific papers including our own work, and presents the geology and hydrocarbon prospects in digital format. All digitised maps are constructed in ArcGIS 10.5. All features are clearly labelled and cross-referenced to original authors. These are the most detailed Atlantic margin maps available in the public domain. Our sophisticated plate fit becomes especially powerful when evaluating new frontier areas with little information, where the conjugate margin has more data and where proven petroleum systems exist. Digitised geological and geophysical maps for the West African margin from Guinea to Nigeria, and the South American margin from Guyana to Potiguar. Comprehensive Basin dossiers for all 18 basins. Block Evaluations of Brazil ANP License Rounds 1-9 and 11. Seismic lines, block evaluation spreadsheets, well summaries, and individual basin dossiers from the 11th Licensing Round for the Equatorial margin of Brazil. Uniform compilation of hyperlinked published seismic cross-sections (700+) and well data (200+). Equatorial Atlantic Margin specific Bibliography: 500+ references. Move your mouse over the map below to view a detailed zoom.